Carrier signs contract for 100 B737 MAX aircraft worth $12.7 billion in UK on July 18. 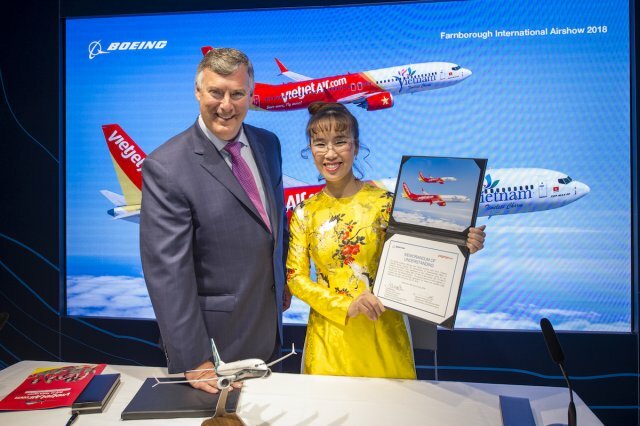 New-age carrier Vietjet Air signed a contract with Boeing to purchase 100 B737 MAX aircraft worth $12.7 billion at the Farnborough International Airshow 2018 in the UK on July 18. “Today’s agreement for a repeat order from Vietjet validates the best-in-class capabilities of the 737 MAX family of airplanes,” said Mr. Kevin McAllister, President and CEO of Boeing Commercial Airplanes. Vietjet’s new order will go towards serving the carrier’s development of airline alliances across the Asia-Pacific region and worldwide and further enhance its fleet synchronization, modernization, and fuel efficiency to 2025. “We are honored to deepen our strong partnership with Vietjet as they become our newest 737 MAX 10 customer,” Mr. McAllister said. Under the contract, Boeing commits to deploying a series of strategic partnership programs to develop a modern aviation service ecology in Vietnam, including Maintenance, Repair & Overhaul (MRO), training of pilots, technicians, engineers, and more, and special programs for enhancing the management and automation capabilities for airlines in Vietnam and Vietnam’s aviation industry as a whole. Vietjet currently has a fleet of 60 aircraft, including A320s and A321s, and operates more than 385 flights each day. It has transported more than 60 million passengers on a network featuring 93 routes in Vietnam and across the region, including Thailand, Singapore, South Korea, Taiwan, Hong Kong, Mainland China, Malaysia, Indonesia, Myanmar and Cambodia.